Below is a preview of one of the articles in the new KROST Quarterly Real Estate Issue, titled "Section 45L Tax Credits: The Most Overlooked Tax Credit for Residential Developers" by guest author, Brandon Val Verde, Senior Manager - Green Building Tax Incentives, KBKG. The §45L credit is a federal tax incentive for developers of apartments, condos, or spec homes that meet certain energy efficiency standards. Eligible construction also includes substantial rehabilitation. 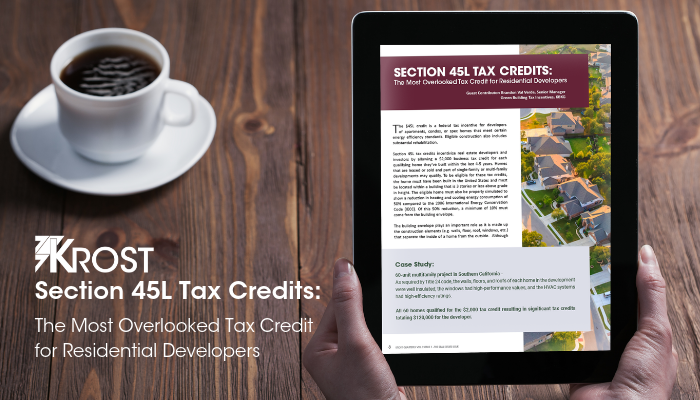 Section 45L tax credits incentivize real estate developers and investors by allowing a $2,000 business tax credit for each qualifying home they’ve built within the last 4‐5 years. Homes that are leased or sold and part of single‐family or multi‐family developments may qualify. To be eligible for these tax credits, the home must have been built in the United States and must be located within a building that is 3 stories or less above grade in height. The eligible home must also be properly simulated to show a reduction in heating and cooling energy consumption of 50% compared to the 2006 International Energy Conservation Code (IECC). Of this 50% reduction, a minimum of 10% must come from the building envelope. KROST Quarterly is a digital publication that highlights some of the hot topics in the accounting and finance industry. Volume 2, Issue 1 covers real estate trends and news including Opportunity Zones, Delaware Statutory Trusts, Cost Segregation, 1031 Exchange, Green Building Tax Incentives, and Qualified Improvement Property. Much thanks to you for sharing background and thoughts!